There is a world of exciting rewards and wonderful opportunities that await independent Filipino grocers, especially those who have made the country’s leading one-stop grocery distribution company—Suy Sing Commercial Corporation—their trusted partner in running their business. During the Suki Day 2017 held at the World Trade Center in Pasay City, thousands of loyal ka-Suy Sings became virtual tourists and adventurers as they visited “United States”, “Japan”, “Nepal”, “Indonesia”, “China”, “Switzerland”, “Netherlands”, “Argentina”, “Norway” and other tourist destination-themed booths to discover the “World of Success” that they can experience with Suy Sing. To signify how the company and its trade partners help the PInoy grocers’ business soar to new heights, executives of the country’s leading consumer goods manufacturing companies gamely donned their captain’s hats and stood in front of an airplane to unveil the much-awaited Suki Day and welcome aboard thousands of excited Ka-Suy Sings. Booths featuring world-renowned landmarks such as the Statue of Liberty, Leaning Tower of Pisa, Eiffel Tower, Great Wall of China, Mount Everest and the Himalayas attracted crowds of attendees with their selfie-worthy colorful backdrops. Exciting games and prizes, entertaining shows and gimmicks, special deals and promos, and new products and freebies also made Suki Day more fun and rewarding for thousands of attendees. Stressing the vital role of Filipino grocers in not only making their business reach a world of success but effectively managing it for the long run, Guthrie Jensen engaged business owners in a Mastering Management seminar as part of Suy Sing’s Suki Success Series. Participants learned to manage their business, themselves, their people and productivity by setting goals and making plans to achieve them, assigning responsibilities to accomplish tasks, motivating employees, and evaluating work. To highlight the celebration, Suy Sing served a delicious lunch buffet in a dining area where hundreds of tables filled most of the spacious World Trade Center. The company also treated the guests to a delightful and entertaining show courtesy of singer-comedian K Brosas, actor-comedian Chokoleit, and some unsuspecting members of the audience who took part in hilarious contests. 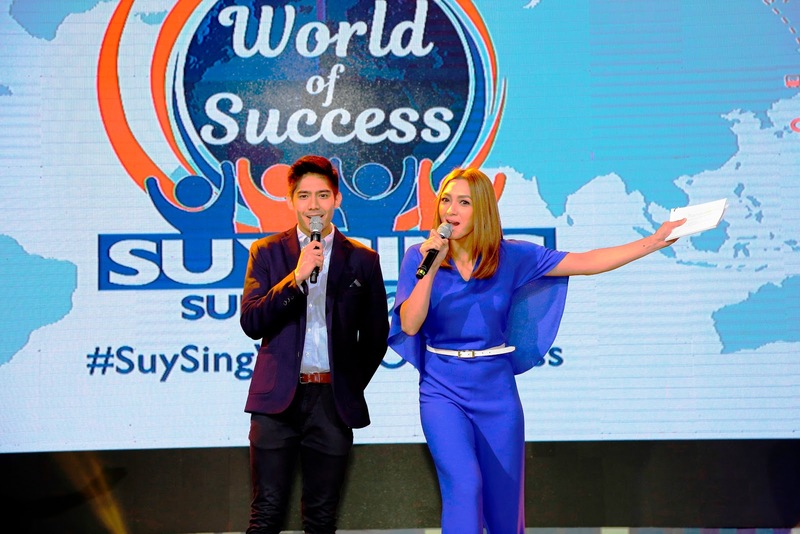 As main program hosts, Robi Domingo amused the audience with his hugot lines while Iya Villania serenaded the 25- to 55-year “S Factor” awardees with a song number. Capping off the afternoon’s entertainment was singer-songwriter Ogie Alcasid who sang his signature ballads and dished out his own brand of humor. 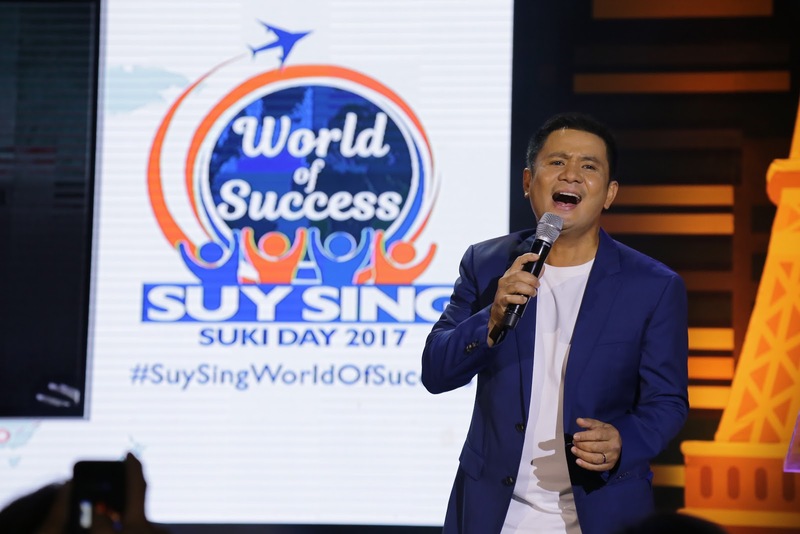 Singer-songwriter Ogie Alcasid serenades the audience with his most-loved ballads. Lots of exciting prizes, including round-trip tickets to Japan, Apple iPhones, other gadgets and appliances were raffled off to Ka-Suy Sings. One very lucky grocer even went home with a brand new Mitsubishi Adventure in the grand raffle draw. Bags full of grocery items and The North Face backpacks were given to grocers who completed the booth hopping activity. Among the celebrities who visited the different Suki Day booths were Rocco Nacino, Gabby Concepcion, Claudia Barretto, Gerald Anderson, Maja Salvador, Janella Salvador, and Dominique Roque. Executives of Suy Sing and its trade partners, namely (from left) Del Monte Phils. Inc. Customer Development Group Head Patrick Belen Diño; Nestle Phils. Inc. Sales Director Jojo Dela Cruz; Procter & Gamble Phils. Inc. Sales Director Bryan Wong; Alaska Milk Corp. VP-Sales Francisco Idian; Peerless Product Manufacturing Corp. VP-Sales & Marketing Jasper Tiu; Suy Sing executives Elma Ainza, Virginia Lim, Tina Tan, and Reina Sy; Unilever Phils. Inc. Chairman & CEO Benjie Yap; Century Pacific Food Inc. President & CEO Christopher Po; Nutri-Asia Inc./First PGMC Enterprises Inc. President & COO Angie Go Flaminiano; Monde Nissin Corp. CMO Ruffy Tiam-Lee; and Mondelez Phils. Inc. Country Head Ashish Pisharodi pose with the success sign during the opening of Suki Day 2017. 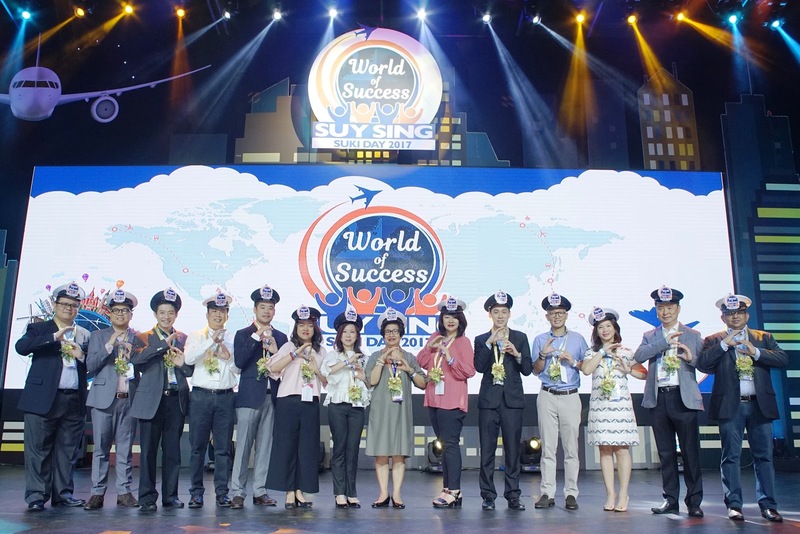 With over 70 years-worth of experience in nationwide grocery distribution, Suy Sing has definitely brought a world of success not only to its customers, but also to its trade partners. For more information on how Suy Sing can bring your grocery business to a world of success, call the Suy Sing customer hotline at 706-8888, the provincial toll-free number at 1-800-10-7068888 or visit www.suysing.com.